Okay, take a look at the Technorati top 200. Maybe take a look at the new alcohol blogs that are coming out that are popular. These blogs have STAFFS! They have 10 people looking for content and 2 doing layouts. The days of being the citizen blogger are over. Enter micro-blogging! Twitter, Facebook, etc. They're all the new blog and I'm jumping ship. This page will still be used for long-form stuff (like when I do reviews), but if you want the regular updates and quick info, then subscribe to the Twitter. "But I don't want all those links sent to my PHONE!" you say. Subscribe as web only. Subscribe to the RSS of the web only. Use Twhirl! You may think you're getting less, but you're getting more! That's right! More! More content, more snarky remarks, more links to cool stuff, less me pontificating on the value of pants. If you have one of them new-fangled iPhones that all the kids seem to be carrying these days (and not being able to make calls because AT&T's network is so bad), then you're going to love this, except it's not for the kids. Pocket cocktails has 300+ full color pictures of all the cocktails in it's database and even has a randomizer in case you're bored and you have way too many ingredients in your bar to use. It would be nice if it had a database of drinks that it *didn't* have cocktails for, but hey, at least it gives you something to do during those frequent times that you have no service. If you're one of the snobby members of Wine Spectator.com (like me) then you're going to love their new mobile site. 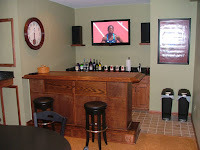 You get all the access to their content of 200,000 reviews, vintage charts, and your personal wine lists. If you're looking to be the resident genius when you're out on the date and trying to figure out if you should order that bottle of Smoking Loon or Cain V, then this is the site for you. You will need to be a member, which costs $49.95 a year for online access only, but if you're looking to expand what you know about wine, this one's a good start. Finally, the bar that combines my favorite two things: Booze and video games. This bar starts off looking like any other oak bar that someone built from a 500 year old oak that they cut down because it ruined their view of the freeway, but this one has something extra special. Joysticks-that-appear-as-if-from-nowhere come out of this bar and give you access to play your favorite MAME games (these are usually classic games that you found at the old arcades). Can you just imagine the hours and hours of drunken Mortal Kombat or Moon Patrol? ARE YOU KIDDING ME? FREAKIN' MOON PATROL? You can't have this because someone made it and they won't sell it to you. Click on the pics for bigger pics. Modern Spirits came out with some pretty funky vodka flavors for a bit and have since backed off to straight, vanilla, and lemon. Their latest product is Tru Organic Gin. The gin keeps alive their policy of making organic, sustainable spirits and has something else unique, an amber hue that gives the small-batch gin some identity. Why the crazy color? Well, most gins are re-distilled after jumiper berries are mashed up in the spirit, Tru keeps it real by just straining it and shipping it out. Maybe their cheapskates and just wanted to skip a step. Vampyre vodka is a bit confused. On the bottle, they spell it "Vampyre" but on their site and their web address, it's "Vampire." A big, fat, Stan Lee style, No-Prize for the marketing guy that explains this one away. Either way, it's a blood-red vodka that has hints of almond and a slight sweetness that makes it go down easy. It's perfect for having around the house for the month of October then trying to give it away the unused portion to your alcoholic aunt at Christmas. Man, that'll really mess her up. Drinkhacker has a full review on it if you want to know more. The St. Germain's Elderflower Liqueur is pretty much the favorite thing in my bar. It goes in almost any drink and gives it a great flavor profile. 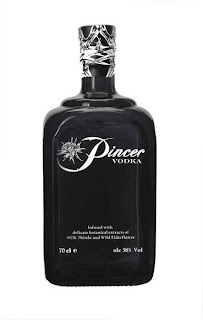 Pincer vodka not only has that same elderflower taste but also milk thistle and is combined with grain vodka to produce, what they claim to be, an almost hangover free vodka. The healing powers of elderflower and milk thistle are two items that are supposed to help you get up a little easier in the morning. The product is about to launch in the UK with no pricing set as of yet. I'm a media whore when it comes to cool commercials. George Clooney's Martini commercials are some of the best out there and this new one from Diddy and Ciroc is damned good. It's Diddy partying to one of Sinatra's tunes and it was actually filmed in one of Sinatra's previous homes. Kickass. So much vodka, tons of time, but one post on them both. Let's start off with Alaska. Just the other night, I woke my girlfriend from a sound sleep and practically screamed in her face, "ALASKA HAS NO VODKA TO CALL IT'S OWN!! WHY WOULD SARAH PALIN ALLOW THIS?" Now I (and my girlfriend) can sleep easy knowing that Permafrost vodka has stepped up to the task. This vodka is made from Matanuska Valley-grown potatoes, known for their high Potassium, vitamin C and B6 content, and water from Alaska glaciers. The company sources everything from Alaska and also operates as a green distillery. It's made by a former bush pilot and already has the state all aflutter with it's first batch about to be released in 45 days. It will be selling wholesale for US$50. Hawaii is getting it's first truly Hawaiian vodka. The forgettable Ocean Vodka has it's potatoes sourced from Idaho whereas the new Pau Maui vodka is made right in Hawaii. I don't put a ton of cocktail recipes in here because there are so many that are just variations on a theme that I would get bored of reading my own blog. Yes, I read my own blog, it's mostly for my own entertainment. I like this one, though. It's timely, well thought-out, and Fall just hit us hard so I'm in the mood. I'll keep the brand name in there because, well, they thought of it. In a Boston glass add grapefruit and cranberry syrup. Muddle, add 1 ice scoop then GranGala, rum and bitters. Shake well and pour into a young wine glass. 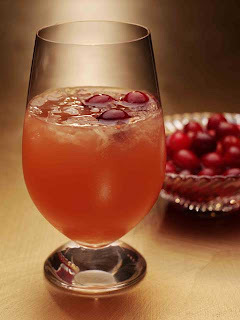 Garnish with drunken cranberries. Update! Someone did some digging and came up with some pretty compelling evidence that it's the real thing and not a publicity stunt. Read more here. My BFF Lisa sent me a link to this video that shows Dan Akroyd pimping a vodka that is inside of a crystal head. There's some back story to this that's explained in the video below. I'm actually kind of at a loss for what to even say about this. Dan Akroyd keeps looking at me like he's channeling P.T. Barnum. However, he's also been involved with the occult for quite some time. Once, he even made the Statue of Liberty walk through New York to a catchy 50's tune. Here comes Crystal Head Vodka, a diamond-filtered vodka or a very dry infomercial to pimp Ghostbusters 3. Where the hell was this last May? Peter's Planters Punch is a delightful mix of all the things that you get to sip when you're hanging out at the island bar. You know, the bar that you worked at right after your stint as a big-time flair bartender in New York but then your best friend betrayed you by sleeping with the girl you were dating and kept walking around spouting off "laws" that he made up but it's okay because you met a really cute, sweet girl who liked you a lot and when you get back to New York you find out that she's rich and having your baby. Also, you have to add the rum, but it has everything else in it. Right now, you can only get the stuff in South Florida, which just doesn't make sense to me. 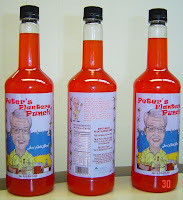 The rest of us NEED this stuff for our mental sojourns to the islands. These people have a responsibility to the rest of the world!